Cuong Nhu was founded in 1965 by Grandmaster Ngo Dong. 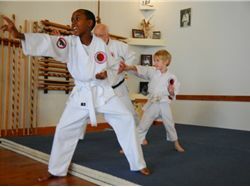 Cuong Nhu Oriental Martial Arts Association is a federally recognized non-profit educational organization. Cuong Nhu is a martial art that blends the basic elements of a number of different styles. 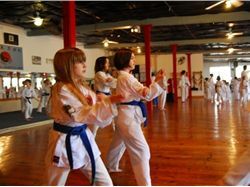 Cuong Nhu has its roots in Shotokan Karate and combines aspects of Aikido, Judo, Wing Chun, Vovinam, Tai Chi Chuan, and Boxing. It is this blending of hard and soft styles from which Cuong Nhu (pronounced Kung New) derives its name, which is Vietnamese for Hard (Cuong) - Soft (Nhu). Cuong Nhu was brought to the United States in 1971, when Grandmaster Ngo Dong came to the University of Florida to earn his Ph.D. While there he founded the Cuong Nhu Karate Club. This club quickly grew into the largest intramural club on campus, with over two hundred students participating. Another school, the Center, was then established in Gainesville to serve people of all ages outside the university community. Many of the early students from these schools went on to establish their own Cuong Nhu dojos after leaving Gainesville, thus spreading the style all over the United States and around the world. Grandmaster Ngo Dong was succeeded by his son, Grandmaster Quynh Ngo as the Head of Cuong Nhu Oriental Martial Arts.